Pro Archia was delivered by Cicero in defense of A. Licinius Archias, a Greek poet whose eligibility for Roman citizenship was challenged in 62 BCE. Cicero’s emphasis in the speech is on literature’s humanizing value. Cerutti provides comprehensive treatment of grammatical issues with keen analysis of the rhetorical devices Cicero wove into the oration. This revised edition includes input from Linda A. Fabrizio, author of the Teacher’s Guide, and a new appendix featuring eight selections from Quintilian. With this new edition of his popular text and commentary on Cicero's Pro Archia, Steven Cerutti provides Latin instructors on both the secondary and post-secondary levels an excellent option for intermediate learners. This 3rd edition includes many of the same features of the first two editions, but with the addition of a third appendix with selections from Quintilian's Institutio Oratoria. Having just used this book as part of an advanced undergraduate course on Roman Oratory, I can highly recommend it for learners who are not quite ready for the jump to a more scholarly text-commentary (e.g.Cambridge). Cerutti's edition is broken into three basic sections: a brief introduction, the text-commentary itself, and three appendices. First, he provides a brief introduction (11 pages) to lives of Cicero, Archias, and Quintilian, along with a synopsis of the Pro Archia itself. The introductions to each of the figures are exceedingly brief, but adequate as a starting point. The synopsis, however, is quite useful for assisting learners in keeping track of the larger legal and oratorical arguments while they are translating smaller sections of the speech. After this introduction comes Cerutti's text-commentary. As in previous editions, the text is presented in a clean and attractive manner. The text is presented with both traditional sections and running line numbers, making it easy to locate specific words and sentences in the classroom setting. Pertinent commentary and notes are included beneath each page of text, and the facing page features a running vocabulary. It is in this setup that the real strength of this edition lies. Unlike a great many other text-commentaries, Cerutti's setup allows learners to have all the information they need to translate and analyze the text on the same page as the text itsel£ Although this edition has a traditional glossary at the back, because of the running vocabulary there is no need for constant flipping back and forth to a glossary or commentary in the back of the book. In my class, this was a major benefit that all learners enjoyed. The nature of the running vocabulary itself is also an attractive feature of this edition. All but the most basic Latin words are included in standard dictionary format. However, it is the frequency of inclusion that provides a greater aid to learning. As Cerutti notes in his Preface, "The second time a word occurs, it is marked with an asterisk; the third time, two asterisks; the fourth time, three asterisks, and thereafter it is dropped from the list" (Cerutti, xiii). The aim of such a gradual move is simple: it simultaneously alerts learners to frequent vocabulary and makes learners more responsible for these words. In terms of instruction, such a running vocabulary can also aid instructors in creating vocabulary lists for assessment. The commentary itself is fairly basic, focusing more on topics of interest/ use to intermediate Latin learners: grammar, syntax, and literary devices. Very little in terms of socio-political, literary, or textual commentary is given. Instructors in more advanced classes will need to supplement with more material. The third section of the edition is comprised of three appendices. Appendix One provides a brief glossary of proper names and places mentioned in the Pro Archia. Appendix Two features a list of literary devices complete with a brief description and examples from the Pro Archia. Moreover, Cerutti also marks out specific terms that are part of the Advanced Placement (AP) Curriculum. Appendix Three is the only substantive difference between this edition of Cerutti's work and the previous two. This appendix features a text -commentary on selections from Quintilian's Institutio Oratoria a set up in the same manner as that of the Pro Archia (i.e. text-commentary on one page with the running vocabulary on the facing page) . Cerutti states that through the inclusion of these selections of Quintilian, "it is [his] hope and aim to enhance students' appreciation for Cicero's rhetorical artistry as the leading advocate and legal mind of his time" (xi). Appendix Three itself consists of eight selections that range from four to twenty-eight lines. Moreover, each selection comes with a suggestion for when to include it in the instruction of the Pro Archia. For example, selection one tocuscs on the purpose of the exordium; therefore, Cerutti suggests that this selection be read immediate after Pro Archia, line 41, the end of the speech's exordium. Such selections arc an attractive feature of this edition, as they could easily be incorporated as sight quizzes, as graded translations, or simply as a springboard to class discussions on Cicero's oratorical technique. 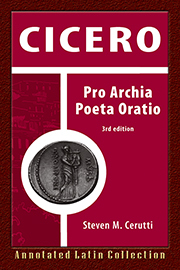 Overall, Cerutti's newest edition of his text-commentary on Cicero's Pro Archia makes an attractive addition to an intermediate Latin course on either the secondary or post-secondary level. The presentation of the text-commentary and running vocabulary on facing pages provides a great introduction to learners who either are making the transition from textbook Latin to 'real' Latin or are not yet at a proficient enough level for scholarly text-commentary. Likewise, Cerutti's inclusion of selections from Quintilian's Institutio Oratoria provides instructors with a variety of curricular opportunities to pursue and marks his edition as unique among text-commentaries on the Pro Archia. Marcus Tullius Cicero (3 January 106 BC - 7 December 43 BC) was a Roman philosopher, politician, lawyer, orator, political theorist, consul and constitutionalist. He came from a wealthy municipal family of the Roman equestrian order, and is widely considered one of Rome's greatest orators and prose stylists. Now in a revised and expanded third edition, "Cicero: Pro Archia Poeta Oratio" is Cicero's defense of A. Licinius Archias, a Greek poet whose eligibility for Roman citizenship was challenged in 62 BCE. Cicero's emphasis in the speech reflects a humanizing value that is as relevant today as it was in antiquity. In his presentation and notations, Steven M. Cerutti (Associate Professor of Classics, East Carolina University) provides a comprehensive treatment of grammatical issues with an informed and informative analysis of Cicero's rhetorical devices in his oration. This new edition features the full Latin text; grammatical, literary, and historical notes; a running vocabulary, a glossary of proper names and places; a glossary of terms; and eight selections from Quintilian with notes and vocabulary. The newest addition to the outstanding 'Annotated Latin Collection' published by Bolchazy-Carducci, "Cicero: Pro Archia Poeta Oratio" is enthusiastically recommended for Latin Language academic curriculums and Latin Studies supplemental reading lists.